On the general test, there is an update of 102. It is expected to return the Klondike map, improve customization, balance corrections of object 268, variant 4, in addition to several revised maps and two new Soviet tanks of the tenth level. After the update 9.22 in the world of tanks tanks appeared “under the tarpaulin,” neither names nor technical characteristics were known, it is time to disrupt the covers. The total test goes to K 91 and the object 277. Another plus machine is good for its class of disguise. Of the characteristics it is clear that the role of K 91 in combat is supported. Another new Soviet tank facility is Object 277. The car is tuned so as to preserve the habits of the T-10, not to exclude the weaknesses, to maintain the dignity of good speed and maneuverability. On the test came object 268 version 4 with new characteristics, when the car appeared, it immediately showed good efficiency, which is not surprising because the first to take it the best players. This tank has excellent maneuverability and mobility, strong armor and high speed of backward movement. 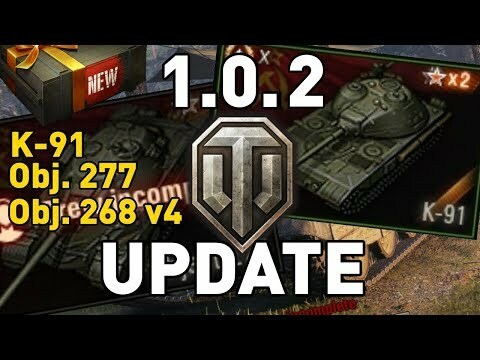 With what exact characteristics the tank will get in the update 1.0.2 is not yet known. Now about the maps on the test, you can try 4 modified areas of editing were made based on statistics and reviews of players. On the robin, respawn teams became further apart, the bushes on the balcony grow in a new way and the relief has changed slightly. On the slope, the church was unfolded and the low ground was made, a sprout was raised from the swamp. In general, the edits are aimed at strengthening the team that plays with the top base. lower base. On the outskirts of the ravine it became more convenient to play from the tower. On the descent from the hill an alternative exit to the base appeared. Erlenberg received his portion of the edits. The biggest changes have occurred in the castle area, it will be more difficult to defend it. The position on the shore has improved, now it is more convenient to shelter from here. New physics of motion of tanks in .GIF!